We are really excited that we can announce, that Quantopian started to publish series of articles where they will really deeply analyze some of Quantpedia's suggested strategies. Earnings are a highly studied event with much of the alpha in traditional earnings strategies squeezed out. However, the research here suggests that there is some level of predictability surrounding earnings and corporate actions (Buyback announcements). In order to validate the authors' research, Soeng Lee from Quantopian attempts an OOS implementation of the methods used in the Amini&Singal whitepaper. He examines share buybacks and earnings announcements from 2011 till 2016 finding similar results to the authors with positive returns of 1.115% in a (-10, +15) day window surrounding earnings. The results hold true for different time windows (0, +15) and sample selection criteria. Soeng finds the highest positive returns for earnings that are (5, 15) days after a buyback announcement (abnormal returns of 2.67%). Also, the main study by Amini&Singal was focused on buybacks greater than 5%. However, the robustness test that included all buybacks appears to outperform the main study. The test looking at buybacks 1 ~ 30 days before an earnings announcement also performed better than the 16 ~ 31 days criteria (as suggested in Amini&Singal) with a greater sample size. Title: Has Momentum Lost Its Momentum? We evaluate the robustness of momentum returns in the US stock market over the period 1965 to 2012. We find that momentum profits have become insignificant since the late 1990s partially driven by pronounced increase in the volatility of momentum profits in the last 14 years. Investigations of momentum profits in high and low volatility months address the concerns about unprecedented levels of market volatility in this period rendering momentum strategy unprofitable. Past returns, can no longer explain the cross-sectional variation in stock returns, even following up markets. Investigation of post holding period returns of momentum portfolios and risk adjusted buy and hold returns of stocks in momentum suggests that investors possibly recognize that momentum strategy is profitable and trade in ways that arbitrage away such profits. These findings are partially consistent with Schwert (2003) that documents two primary reasons for the disappearance of an anomaly in the behavior of asset prices, first, sample selection bias, and second, uncovering of anomaly by investors who trade in the assets to arbitrage it away. In further analyses we find evidence that suggest three possible explanations for the declining momentum profits that involve uncovering of the anomaly by investors, decline in the risk premium on a macroeconomic factor, growth rate in industrial production in particular and relative improvement in market efficiency. "In this paper, we investigate whether momentum profits have been driven away or at the very least its pattern altered in the wake of growing knowledge about momentum strategy and competition amongst arbitrageurs who trade on it, if we were to believe momentum profits were caused in the first place due to delayed price reactions to firm-specific information as suggested by Jegadeesh and Titman (1993, 2001). Our analyses span over the period between 1965 and 2012. We divide the entire time period into three subperiods. The first subperiod corresponds to the Jegadeesh and Titman (1993) sample period, 1965 to 1989, the second subperiod covers the Jegadeesh and Titman (2001) “out of sample period”, 1990 to 1998, the third subperiod corresponds to the period 1999 to 2012. In our study, we choose to examine the persistence of momentum profits while avoiding concerns of data dredging by conducting tests in our out-of-sample period that starts at the beginning of 1999 immediately after Jegadeesh and Titman’s (2001) “out of sample period” ends. Using the data over the 1999 to 2012 sample period, we find that Jegadeesh and Titman (1993) momentum strategies fail to yield profits in the more recent times. This period is particularly interesting as it witnessed the dot-com bust after catching the boom by its tail and also the financial crisis followed by the greatest stock market meltdown since the great depression. One of our concerns in dealing with this unique period is what if the recent turbulence in the economy with a series of high-loss episodes in the US stock market and unprecedented levels of market volatility has rendered momentum strategy unprofitable? We employ alternate methodologies to scrutinize whether the rapid decline of momentum profits to insignificant levels in this 14 year period is indeed an outcome of the marked rise in market volatility. For instance, we use controls for the periods of unusual volatilities in the capital market, 2007 to 2009 in particular and yet fail to reject the hypothesis that momentum profits have not declined to insignificant levels. Excluding the last financial crisis, 2007 to 2009 serves the additional purpose of excluding spring of 2009 that witnessed the biggest momentum crash in the history of stock market since the summer of 1932 as alluded to by Daniel and Moskowitz (2012). Next, we employ the daily median volatility index, VXO for the period 1986 to 1998 to classify months in the latest subperiod into high and low expected volatility months.5 If momentum profits have declined because of increased volatility of the market, momentum strategy should be profitable at least in months when the implied volatility is as low as in low volatility months in the period 1986 to1998, a period when momentum is profitable. However, what we document is that while momentum strategy is profitable in the period 1986 to 1998 no matter the implied volatility, it fails to generate profit for the period 1999 to 2012 even in the 60 months classified as low volatility months primarily clustered between November 2003 and July 2007. We also investigate whether momentum profits resurface in this period following up markets as documented by Cooper, Gutierezz and Hameed (2004). Not only are these momentum profits insignificant on average following up markets, their distribution also reveal visible and statistical difference from those in the periods 1965 to 1989 and 1990 to 1998, indicating a deeper and more fundamental change in the underlying process of generation of momentum profits, beyond huge market crashes. The distribution of up market momentum profits in this period is extremely volatile interspersed with huge negative returns that suggest that momentum as a strategy has become riskier in the latest subperiod compared to the two earlier subperiods. Further analysis indicates that the idiosyncratic volatility of momentum portfolio returns has increased compared to the previous periods. We also examine whether cumulative past returns can explain the cross-sectional variation in stock returns. In the presence of return continuation, we expect past stock returns to be positively related to current stock returns, especially following up markets since momentum profits are essentially up market phenomena. 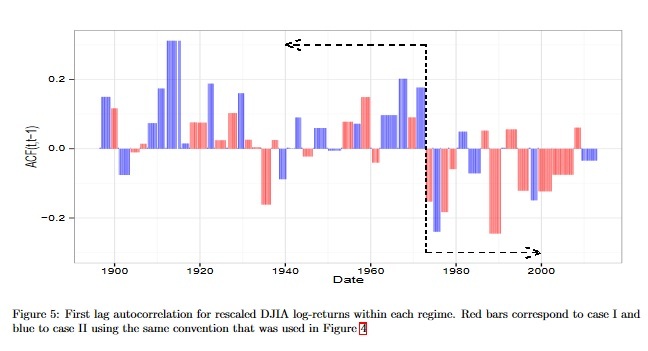 As expected in the periods 1965 to 1989 and 1990 to 1998, current stocks returns are positively related to past returns exclusively following up markets. However, in the current subperiod, with decline in momentum profits past returns fail to explain current returns following up markets and show a reliably negative relation following down market. We suggest three possible explanations for the declining momentum profits that involve uncovering of the anomaly by investors, decline in the risk premium on a macroeconomic factor, growth rate in industrial production in particular, and relative improvement in market efficiency. The first explanation proposes that momentum profits decline post 1998 because investors become increasingly aware about the profitability of implementing a relatively simple momentum trading strategy, wherein they identify winner (loser) stocks and buy (sell) them. The growing awareness and competition amongst these investors would lead to an increasingly earlier identification and trading of momentum stocks. 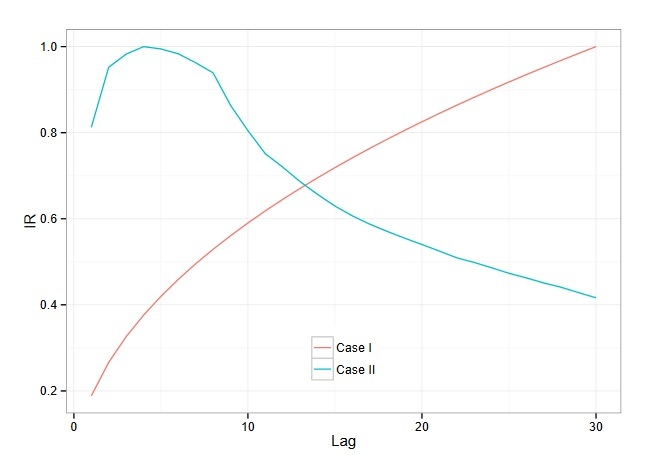 This explanation predicts intensified reaction to both winner and loser stocks in the identification period itself, which would result in either exhaustion or, at the least, a substantial reduction in return continuation in the holding period.6 We find evidence consistent with this prediction. The second explanation is based on the findings of Liu and Zhang (2008) who document that growth rate of industrial production, in various specifications, explains over half of the momentum profits. We find that in the latest subperiod although the momentum portfolio’s returns continue to load on this industrial production factor, this particular risk factor is no longer priced. The third explanation explores the possibility of relative improvement in market efficiency. Following Griffin, Kelley, and Nardari (2010), we compute their DELAY measure, that reflects the degree of response of stock returns to past market returns, and we record a fairly significant reduction in delay in all size portfolios but for the largest one." Recently a range of alternative risk premia products have been developed promising investors hedge fund/CTA like returns with higher liquidity, transparency and relatively low fees. The attractiveness of these products rests on the assumption that they can deliver similar returns. Using a novel reporting bias free sample of 3,419 CTA funds as a testing ground, our results suggest this assumption is questionable. We find that CTAs are not a homogenous group. We identify eight different CTA sub-strategies, each with very different sources of return and low correlation between sub-strategies. When we specify recently identified alternative risk premia as factors to examine the sources of return of CTAs, we find that these premia fail to explain between 56% and 86% of returns. Our results for CTAs suggest that while these new products may deliver on liquidity, transparency and fees, investors expecting hedge fund CTA - like returns may be disappointed. "Our first finding is that CTAs are in fact very different from each other. We utilise statistical clustering techniques to identify different types of CTA and classify them into eight sub-strategies. The different sub-strategies generally have low cross correlation and generate their returns from very different sources. Our second key finding is that alternative risk premia do not explain a large proportion of CTA returns. We use the BarclayHedge CTA database as our source of CTA returns data due to its depth of coverage. Our sample is divided into eight clusters following Brown and Goetzmann (1997). We carry out clustering as an iterative process. Funds are first assigned to initial clusters. Next we calculate the time series of the average cross sectional returns of each cluster. The next step is to estimate the correlation between each fund’s return and each cluster’s return. Using these correlations we reassign funds to the cluster with which they have the highest correlation. The process is repeated until no funds change cluster. The largest category, by number of funds, is Diversified Trend which is comprised mainly of the BarclayHedge “Technical-Diversified” category, while the smallest grouping is Fundamental Carry, which has quite a large spread of BarclayHedge categories but is positively correlated to the carry alternative risk premium. Longer Term Trend is comprised principally of BarclayHedge “Technical-Diversified” category but is correlated with the time series momentum alternative risk premium which is a relatively longer duration signal, whereas Shorter Term Trend is correlated with the option risk premium which captures shorter term trend following effects. Fundamental Value is correlated with the Value risk premium, with a negative Carry relationship, whereas Fundamental Diversified is comprised principally of BarclayHedge “Fundamental - Diversified” category funds. Option Strategies: Short is made up predominantly of BarclayHedge “Option Strategies” funds. Finally, Discretionary funds are comprised of a mixture of technical and fundamental funds, with no obvious match to the BarclayHedge categories or the alternative risk premia. In this paper we use four alternative risk premia to capture the sources of CTA returns - Value, Carry, Time-Series Momentum and Option Strategies. 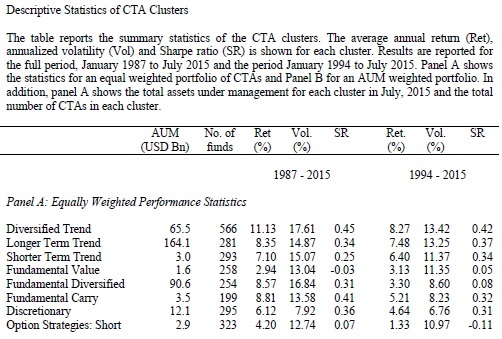 We present an analysis dividing the returns of CTA clusters into alternative risk premia exposure and alpha. Looking first at the equal weighted clusters, the explanatory power of the models is modest with adjusted R2 range from 14% to 44%. All of the clusters have a statistically significant relationship with at least one of the alternative risk premia. Longer Term Trend, Fundamental Value, Fundamental Carry and Option Strategies all have positive value exposure, while only Fundamental Diversified is negatively related to value. Fundamental Diversified, Fundamental Carry and Option Strategies are all positively related to carry, whereas Fundamental Value has a negative carry coefficient. The third alternative risk premium, time series momentum, is positively related to Diversified Trend, Longer Term Trend and Option Strategies"
We show that the market for baseball cards exhibits anomalies that are analogous to those that have been documented in financial markets, namely, momentum, price drift in the direction of past fundamental performance, and IPO under performance. Momentum profits are higher among active players than retired players, and among newer sets than older sets. Regarding IPO under performance, we find that newly issued rookie cards under perform newly issued cards of veteran players, and that newly issued sets under perform older sets. Our evidence is consistent with the predictions of Hong and Stein (1999) and Miller (1977). "Financial economists have documented the existence of simple strategies that earn unusually high or low returns despite the fact that the strategies do not load heavily on common risk factors. For example, Jegadeesh and Titman (1993) document that during holding periods of 3-12 months, stocks that have performed well in the past 3-12 months continue to outperform stocks that have performed poorly in the past 3-12 months. In addition, Ritter (1991) documents that firms that have recently gone public underperform their peers over their first three years of public trading. The point of this study is to use a non-financial laboratory in which some, but not all, of theories trying to explain momentum should apply. If we find momentum, this would be evidence that momentum can exist naturally in markets without the bells and whistles of dynamic growth rates, dividends or mutual funds. Our laboratory is the market for baseball cards. Baseball cards have a long history, dating all the way back to the late 1860’s. By 1991, sales of baseball cards reached $1.2 billion annually. Although baseball cards produce no cash flows, their market values can be substantial. For example, the T206 Honus Wagner, which was produced from 1909-1911, has been sold for as much as $2.8 million. Because there have been long periods of time over which their values have appreciated, baseball cards have often been perceived as investment vehicles. Most theories of momentum do not apply to this market. There are no growth options, dividends, or mutual funds. Among the behavioral theories, Hong and Stein (1999) is the one that should most apply to the market for baseball cards. In their model, momentum arises because information gradually diffuses across the investor population. If Hong and Stein theory is valid, then we should find momentum not only in financial markets, but in any market with gradual information diffusion such as the market for baseball cards. Obviously, there are many significant differences between the market for baseball cards and the stock market. One difference is the level of investor sophistication. In the stock market, there are many hedge funds that can arbitrage away inefficiencies and keep prices in line with fundamentals. In the baseball card market, there are dealers who are relatively sophisticated, but much of the activity in this market is driven by children. Moreover, whereas it is common to short stocks, there is little (if any) short selling of baseball cards. Hence, the opportunity for arbitrage is severely limited in the baseball card market. Because of these differences, if gradual information diffusion is truly a source of momentum profits, we should expect momentum to be significantly stronger in the market for baseball cards because the participants are generally less sophisticated and there are fewer opportunities for arbitrage. Consistent with this prediction, we find that short run (3 month) momentum strategies earn 5.6% per month, whereas momentum strategies in the stock market earn less than 1% per month. Hong and Stein provide additional testable predictions in this market. Active players play up to 162 regular season games per year in addition to the postseason, whereas retired players do not play any games. If gradual information diffusion causes momentum, then momentum should be stronger among the cards of active players than retired players, because there is little to no new information released about the ability (or performance) of retired players. Consistent with this prediction, we find that when the 3 month momentum strategy is restricted to retired players, the strategy earns only 1.63% per month, but when the 3 month momentum strategy is restricted to active players, the strategy earns 9.42% per month. We test also IPO effect (as in Miller (1977))by analyzing the performance of rookie cards and new sets. A card is a considered a “rookie card” if it is the player’s first appearance on a regular issue card from a major card company. Players often have rookie cards before they play in the major leagues, and some players with rookie cards never make it to the major leagues. Like young firms, there is less information about rookies so it is more difficult to determine their quality/ability. Moreover, when sets are first released, there is a lot of uncertainty over the number of sets produced and how other collectors will value the sets. Hence, according to Miller (1977), we should expect rookie cards and new sets to underperform. Consistent with this prediction, we find that rookie cards and new sets have cumulative abnormal returns of –6.6% and –5.7% (respectively) over the 12 months following their release, both of which are statistically significant (t = 2.8 and 2.8 respectively)." In the past 20 years, momentum or trend following strategies have become an established part of the investor toolbox. We introduce a new way of analyzing momentum strategies by looking at the information ratio (IR, average return divided by standard deviation). We calculate the theoretical IR of a momentum strategy, and show that if momentum is mainly due to the positive autocorrelation in returns, IR as a function of the portfolio formation period (look-back) is very different from momentum due to the drift (average return). The IR shows that for look-back periods of a few months, the investor is more likely to tap into autocorrelation. However, for look-back periods closer to 1 year, the investor is more likely to tap into the drift. We compare the historical data to the theoretical IR by constructing stationary periods. The empirical study finds that there are periods/regimes where the autocorrelation is more important than the drift in explaining the IR (particularly pre-1975) and others where the drift is more important (mostly after 1975). We conclude our study by applying our momentum strategy to 100 plus years of the Dow-Jones Industrial Average. We report damped oscillations on the IR for look-back periods of several years and model such oscilations as a reversal to the mean growth rate. "Similar to Moskowitz, Ooi and Pedersen, we focus on the momentum of individual assets. We study the technical rule (moving average of past returns) for one asset, therefore avoiding the portfolio effect that is important for cross-section momentum. This work adds to the paper of [ Moskowitz, T. J., Ooi, Y. H., Pedersen, L. H.. Time series momentum.] by looking at the information ratio of the time series momentum strategy. Our work also contributes to the literature of linking momentum to cycles/regimes. However, contrary to the previous studies, we do not associate economical episodes to the regimes. Our approach is to divide and transform the data in a way such that the final asset returns are as close as possible to stationary. We believe that our work is new in this respect. We study momentum by looking at the risk adjusted performance measured by the information ratio (IR) as a function of the look-back lag used to construct the portfolio. Our main new contribution from a mathematical point of view, is to present in close form the risk associated with the momentum strategy. Previous works calculate the same expression for the average return as given here, however they do not calculate the standard deviation of the strategy. Furthermore, we analyze the stability of the results across time as non-stationary effects become important in explaining the results. We find that both autocorrelation and mean drift of the random process are important in the final performance of the strategy. In particular, for look-back periods up to 4 months, the most important effect is the autocorrelation; and for look-back periods larger than 4 months to 1 year, the drift. However, in contrast with previous studies, we find that the mean drift is the most important factor after 1975. In case I, all the autocorrelations are zero, performance comes from the drift. In case II all performance comes from autocorrelation. Lag is in weeks.